The Boston Pride Parade was last weekend; it’s an annual event in the South End and it was a lot of fun despite so/so weather. It was gloomy all morning and later rained, but the crowds still showed up. And we still had our Pride party! A friend of mine lives right at the start of the parade route and has a makeshift deck outside his third floor windows. Hello perfect view! 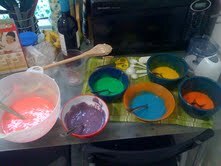 I decided a pride party was the perfect excuse to make Rainbow Cupcakes. They take some time to make but they’re easy AND delicious. Now it’s time to color the batter. You want one bowl of each rainbow color. See above for how to mix the drops to get each color. Don’t they look pretty? Line your muffin tin with cupcake wrappers. I like to spray mine with a little PAM to ensure they don’t stick. 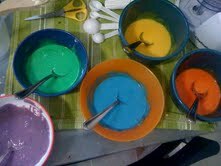 Next, going in order of the rainbow (red, orange, yellow, green, blue, violet) spoon your batter into the cups. As you can see, the colors don’t have to cover one another completely. Pop these bad boys into the oven for 16-18 minutes, until done. Mine took 18 minutes. 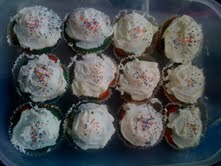 I ended up with 24 cupcakes total. Wait until the cupcakes cool completely, then frost them. I put rainbow sprinkles on mine, just to make them more fun. Then they were ready for transport to the South End. Is there anything more festive than a rainbow? I think not. And did I mention they’re portable enough for deck parties? Always a plus! What’s your favorite party treat?